Over the years in this blog space, a topic I revisit from time to time is the allure of the flat topography that characterizes the coastal and inland prairies of South Louisiana. This photo I borrowed from a friend’s Facebook post re-inspired my captivation with the romantic flatness of the prairie where flatness has nothing to do with featureless. In other prairie views I’ve commented on over the years, the land features spreading away to the horizon provide the visual interest. 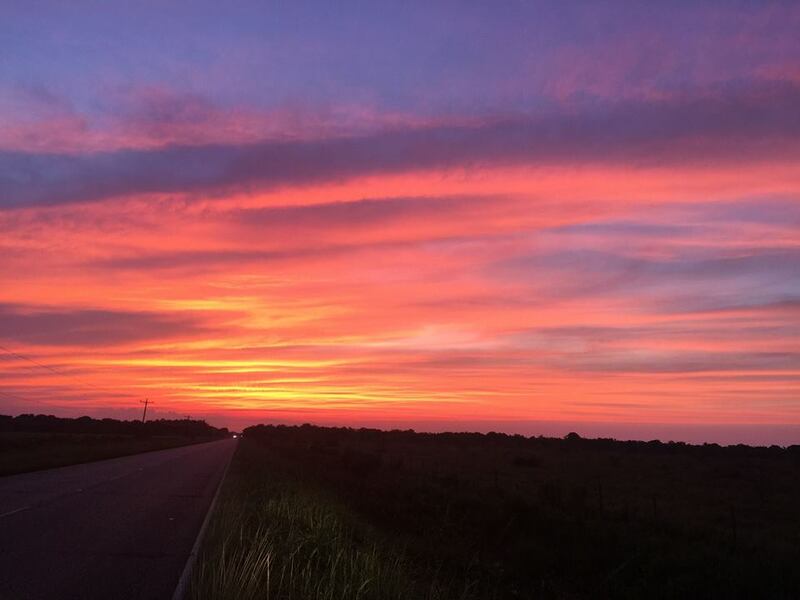 But our regional Gulf Coast summer sunset, offering stunning and contrasting hues of pink and yellow and orange, adds a vertical aspect to the prairie’s flatness. Because the descending dusk reduces the land features to unappealing silhouettes, the real interest rises upward from the horizon where the colorful evening shades bid the Cajun prairie earth bonsoir to another summer day. I composed this piece from ideas drawn from a poetry workshop exercise that former Louisiana Poet Laureate Daryl Bourque gave at his Marais Bouleur family place near Church Point, La., in 2009. I visited Dr. Bourque’s place for an Acadiana Writing Project summer institute field trip. This turned out to be one of the favorite pieces in my portfolio. I read it at my Dad’s funeral on the hallowed grounds of that same church. I know I posted it before, but good stuff merits a re-post. . Owes much to where I’ve been. So be still a while. A neat frame building dressed in white asbestos slate. At the corner of happy and holy. I took the pastor’s sermon on marriage to heart Sunday afternoon. Preaching a sermon on Genesis 2 and the purpose men and women were created for one another in the idyllic beginning, he advanced a compelling assertion of the side-by-side equality of man and woman in matrimony, the notion that each owes to act selflessly in the regard for and consideration of the other. The point was well-made, and a charge ensued as an admonition: Within the next 72 hours, each married partner in the congregation should offer some truly sacrificial act of giving to the other as a living and personal illustration of the message. Mission accomplished! On the way home from Laffy that afternoon I asked Sarah if she’d Iike to stop at Walgreens. She knows I loathe stopping at Walgreens on the way home, because like most men, once I set the course for home, I’m headed for the house. The destination becomes a matter of mission and determination. But she, like most women, usually wants to stop and smell roses along the way . . . well, not so much roses as cosmetics and beauty aids and all the other frilly stuff at Walgreens. So in my mind, by offering to stop without her asking, I’m off the hook for upholding my end of the sermonic obligation. And I even refrained from rolling my eyes or moaning when she accepted the offer to stop. And I never fidgeted or paced or acted impatiently the whole time we were in the store. Someone try to tell me that’s not agape love! OK, Sarah, for my obligation, CHECK. The ball’s in your court for your selfless act toward me—-48 or so hours left and the clock is ticking. 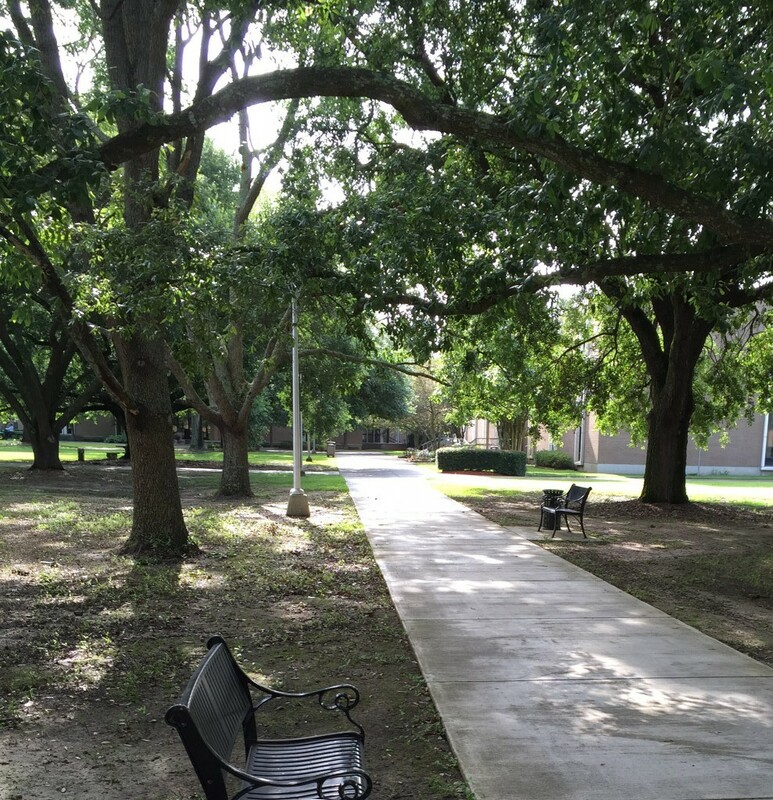 My creative impulse was nagged the last few weeks by a deep shady spot that I pass regularly on campus—-one of those cool, inviting spots where someone can escape the brutal heat and humidity. I gave in to that creative impulse the last couple of days. So far, this is what I came up with. The “place” of the poem. we flee to such shade. and all its sultry ways. 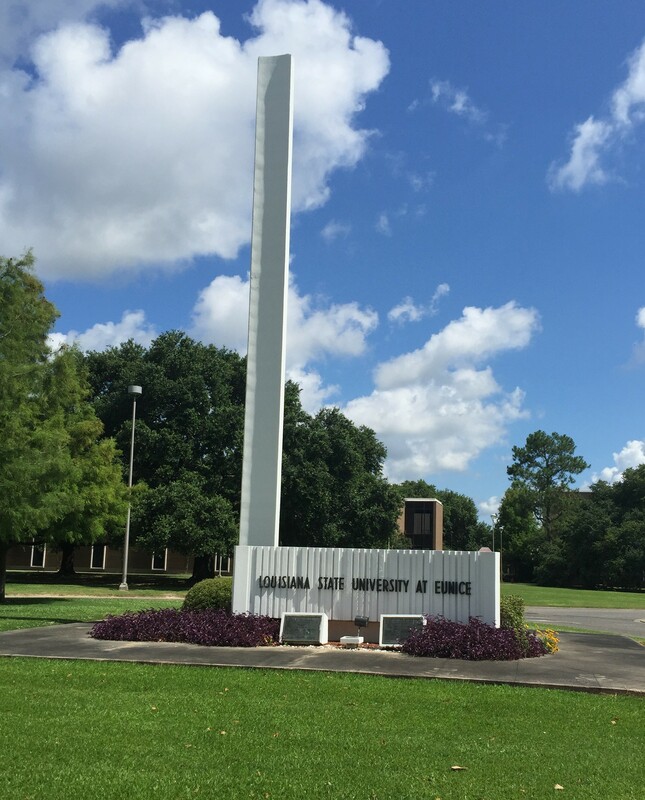 Churches and university campuses almost universally feature iconic steeples, obelisks, and/or bell towers. Since both institutions’ professed aim is the pursuit of truth, the symbolism of the pointed objects obviously points above, a response to what I believe is man’s instinctive response to the search for a higher power (i.e., obviously, God). The secular university, of course, in its humanism, cowers from that assertion; the church, however, embraces it. How attractive, then, the concept of the Christian institution wherein the pursuit of truth proceeds from the interaction of faith and reason? Symbols of truth point to the heavens! Yes, the “F” word for teaching: FUN! 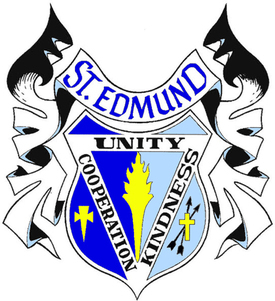 A couple of days ago I signed a contract to teach high school English at St. Edmund Catholic School this fall. That will be my post-retirement fling. And yes, I do mean fling. As this retirement plan has been unfolding, I have known for months that I would not stop working. I wanted to find another job, a next-phase for my career. My criteria for a new position were three-fold: Less stress, fewer work hours, and equal to/greater than income. The opportunity that materialized meets and exceeds all three criteria—-It’s PERFECT. The euphoria and excitement that settled over me for the next couple of days after signing the contract produced an epiphany. I remarked to Sarah yesterday that I had just realized that I haven’t had happy thoughts about going to work for more than ten years. Week after week, month after month, year after year for all that time—-a grind, tedium, obligation, years endured but not enjoyed. What does that sad obervation tell me about my work these past years in higher education administration? It tells me that it’s time to retire! The joy in my present work died several budget-cuts and GRAD Act failures ago. Of course, I never stopped doing the work all these years, but I can’t recall a day in the past ten years when I woke up excited about going to the office. In fact, my waking on many of those days was met with gut-souring dread. So teaching, just plain old teaching, seems to be the God-given answer. After meeting with the principal and some co-workers, and receiving the most warm and enthusiastic welcome and reception from the St. Edmund community these past few days, I’m elated at this return to the purity and simplicity of my vocational calling—-to teach, simply teach, and have fun doing it. I should have known: The past five or six years that I’ve taught a MWF 11:00-11:50 composition class across the hall from my office has born witness. Even though I was teaching as an added duty with no extra compensation, the only three hours of the work week that I could count on being fun, rewarding, or otherwise happy, were those 3 hours of escape from the office, spent before an audience of students. The rest of the work week in and around the office was work—-something I did because it was my job, what I had to do to make a living. When we left the sultry Gulf Coast, late-May climate for Colorado last week, I wasn’t thinking about spring. We were way past spring down south; in my mind, we were on to summer. 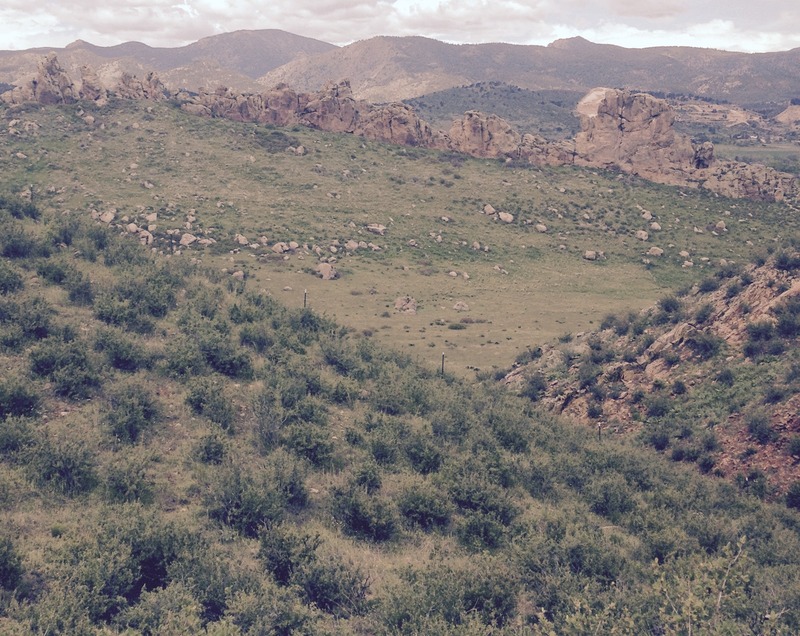 But when we got to the Rockies, especially in the lower elevations of the front range for our hiking trip along Devil’s Backbone, spring had a thing going on. The verdant, grassy meadows below the jagged crests of the heights spread away across rolling valleys below. The fragrance of thousands of blooming plants—-from prickly-pear cacti to sage brush—-drifted delicately in sunny breeze all along the twisting, winding trail. The sensory sensations were subtle, never overpowering; but the airy fragrance was pervasive, fascinating, as the tone and tenor of varied aromas and combinations of aromas waxed and waned along the trail, depending on the species of flora and fauna nearest by. Devil’s Backbone’s jagged spines stand as craggy sentinels watching over the valleys of the front range. The weather was perfect, too. Morning low 48/afternoon high 72, sunny, just breezy enough to dry the sweat brought on by the hike’s exertion. Of all the spring days I’ve known, I believe this one was the queen of them all. The “r-o-c-k” in “Rocky Mountains” surely applies to the season.